If only I could say that this week. This week was actually looking like a pretty good week up until Sunday. It was Sunday that ruined everything that I was working towards. Let’s go back an look at the week that was. Monday was a rest day as usual. Tuesday, the temps were cooler than we had the previous week and look what happened? 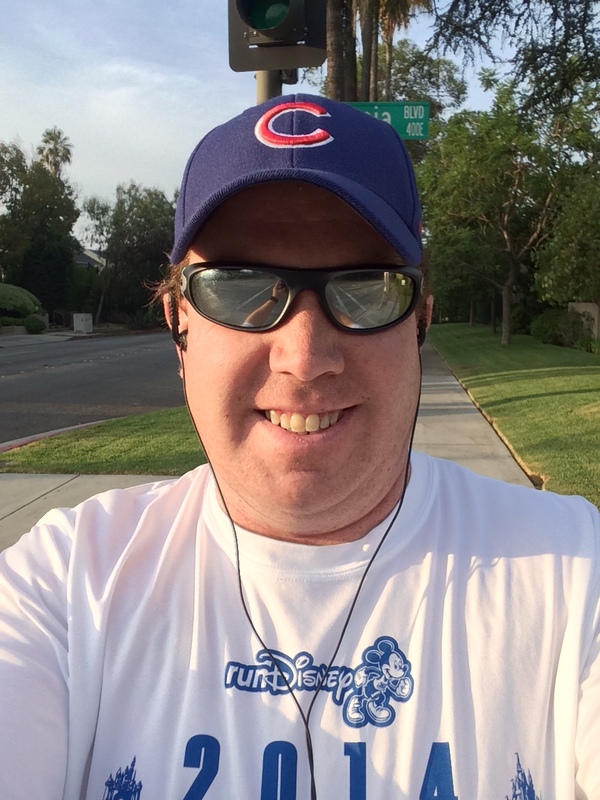 Another 3 miles around the Rose Bowl in less than 36 minutes. Honestly, I was feeling pretty tired when I got home from work on Tuesday and almost skipped the run. My wife was babysitting at our apartment. So, I knew that I couldn’t exactly get rest at home. So, I made my way out to the Rose Bowl to see what would happen. The first mile went well as I finished it in under 11 minutes. The second mile was the roughest. However, I saw that there was the opportunity to finish in under 36 minutes. So, I pushed to make it happen. Considering that I wanted to skip this run, I was super happy with its result! Wednesday was supposed to be a gym day. However, I had so much going on at work that I couldn’t eat dinner that night. So, I skipped the gym. Thursday, the temps were back up. The increased heat took it out of my body. Considering how hot it was, I’ll take the time that was one minute slower! Beyoncé and Jay Z were going to be rocking the Rose Bowl over the weekend. 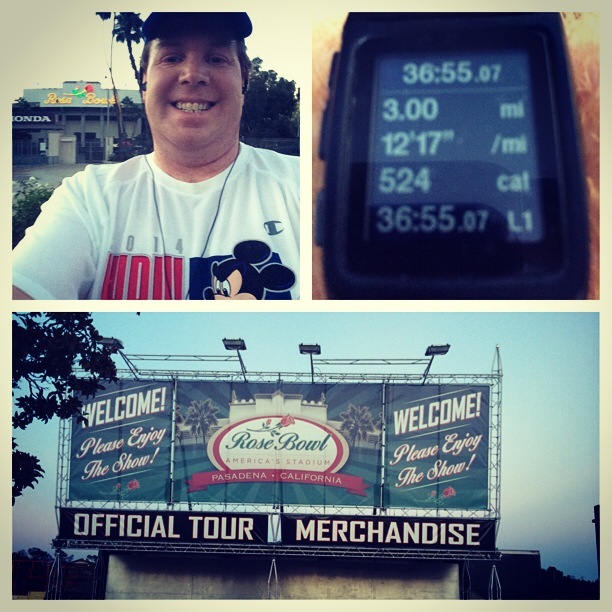 Thursday night, it was my chance to rock those 3 miles. Slow times aren’t always the result of us not pushing ourselves. The slower time was pretty much a result of the increased heat. I could feel it out on the loop. Friday was another rest day. This time, like Monday was by design. Friday was also my last day as the Rights Administration – Theme Parks Secretary for the Walt Disney’s Corporate Legal Department. It was a busy and emotional day for me. My department took me out for Umami Burger at lunch. That was nice. I had a lot of loose ends to tie up before leaving. I was the last one out in my area of the second floor at 6:30pm. That gave me the chance to take a moment to thank God for 6 years and 7 months with this group. 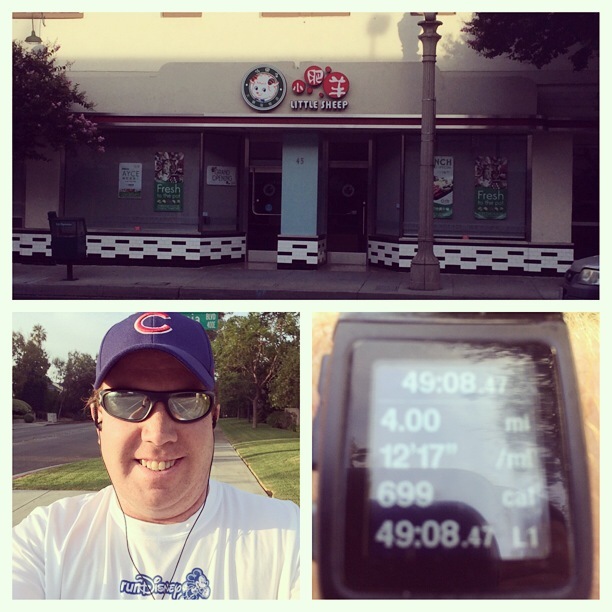 Since they were closing off the Rose Bowl loop early, I decided to run my 4 miles around Pasadena. It is kind of cool to see California Blvd. waking up. Even though I got up early, it was still a rather warm run. However, waiting would mean even warmer temps as the high in Pasadena was supposed to be around the mid 90’s. Along the way, I had to make a quick stop here. The building behind me served as the outside façade for the Peach Pit on Beverly Hills 90210. One day, I Googled to see where the façade for the Melissa and Joey house was located. The blogger who reported that information also had links to other Hollywood filming locations. When I saw that the Peach Pit was right on my 4 mile training loop, I made a note to look for it. Since Brandon, Brenda, Dylan, Kelley, and the gang weren’t around anymore, I continued running. I finished with my fastest 4 mile treks in a while! The last half mile didn’t go so well. Otherwise, I might have finished closer to 48 minutes. 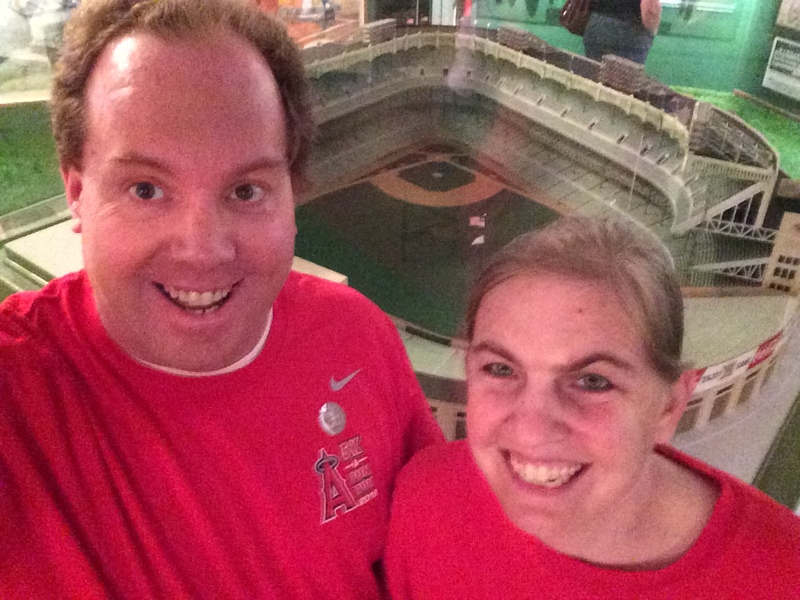 In the afternoon, Brooke and I headed off to the Baseball exhibit at the Ronald Reagan Presidential Library in Simi Valley. 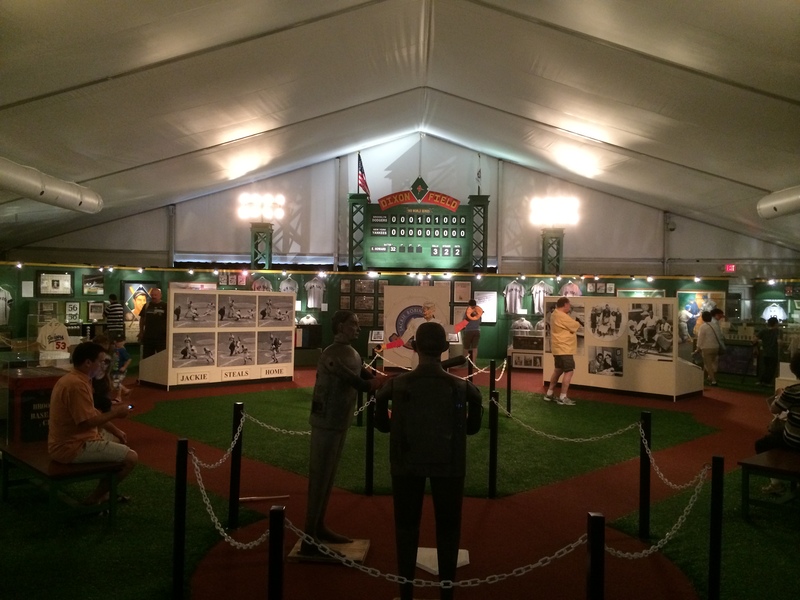 This exhibit is a baseball fan’s dream! 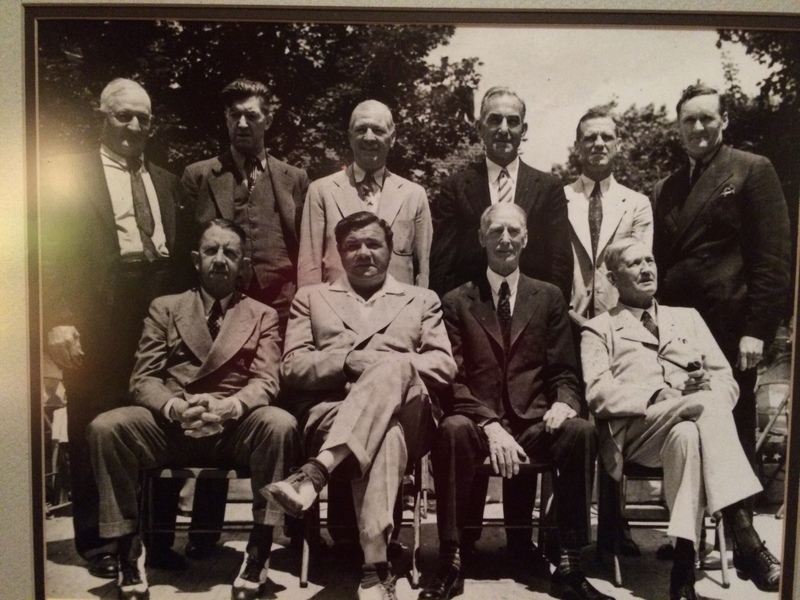 Here is the first class of baseball players inducted into the Baseball Hall of Fame. The display honoring them was pretty cool! 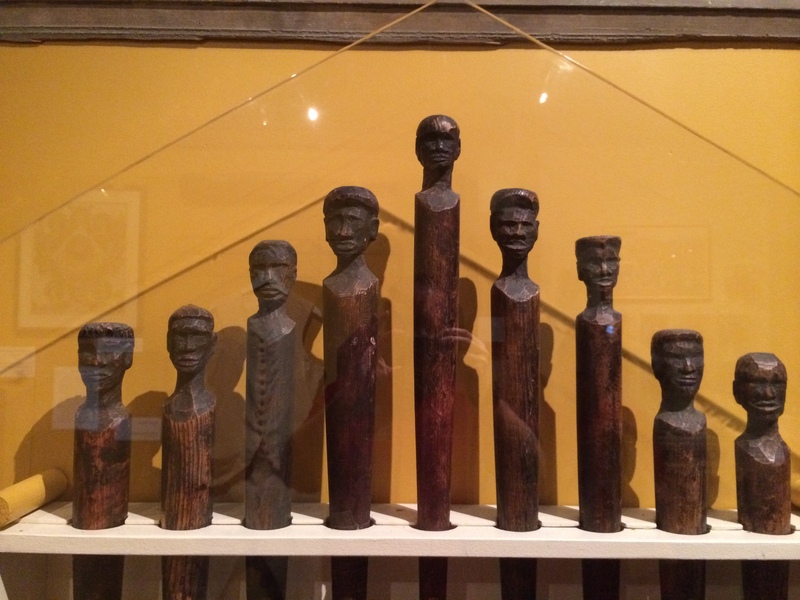 Check out the bottom of some of the bats they had on display! 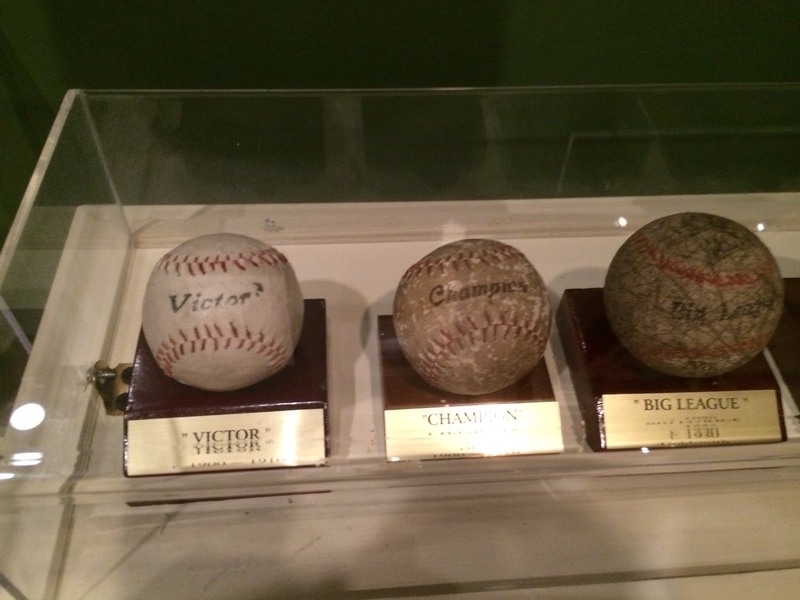 There was a really cool collection of baseballs used throughout the years. 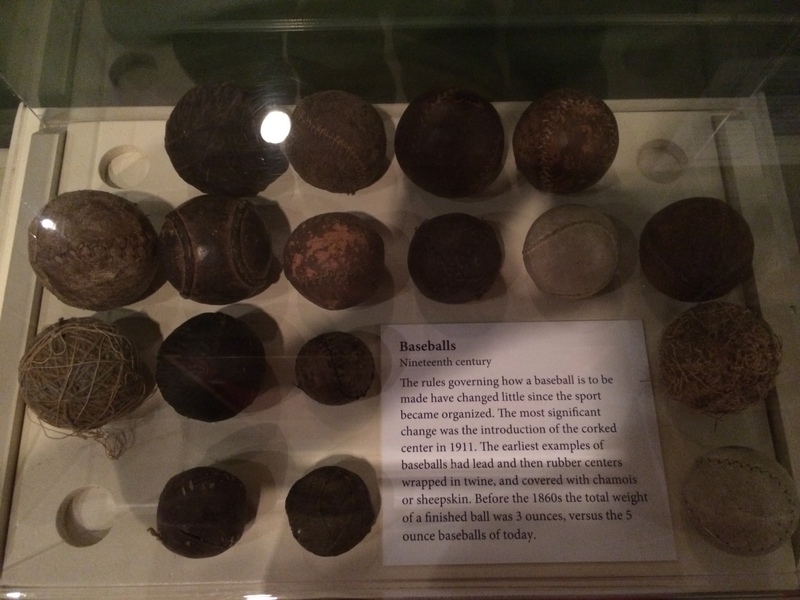 This display talks about how the construction of baseballs had changed over the years. 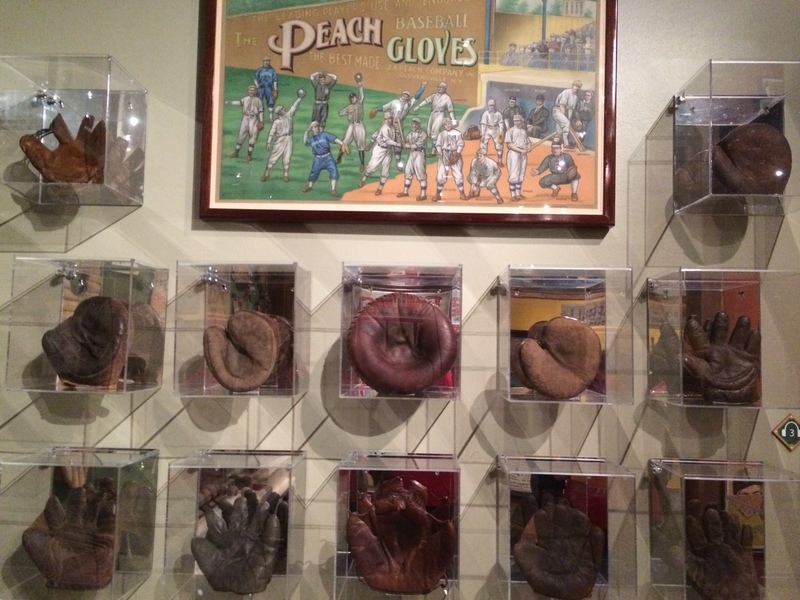 Check out these baseball gloves from over the years! It’s amazing that people could actually use these things to play the game. Hmmm. 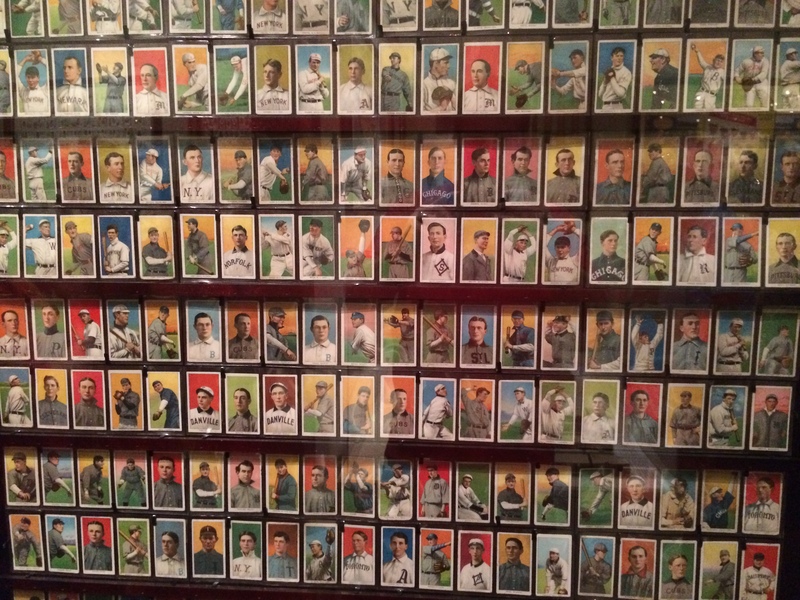 I’ve got to wonder how much these early baseball cards would be worth today. 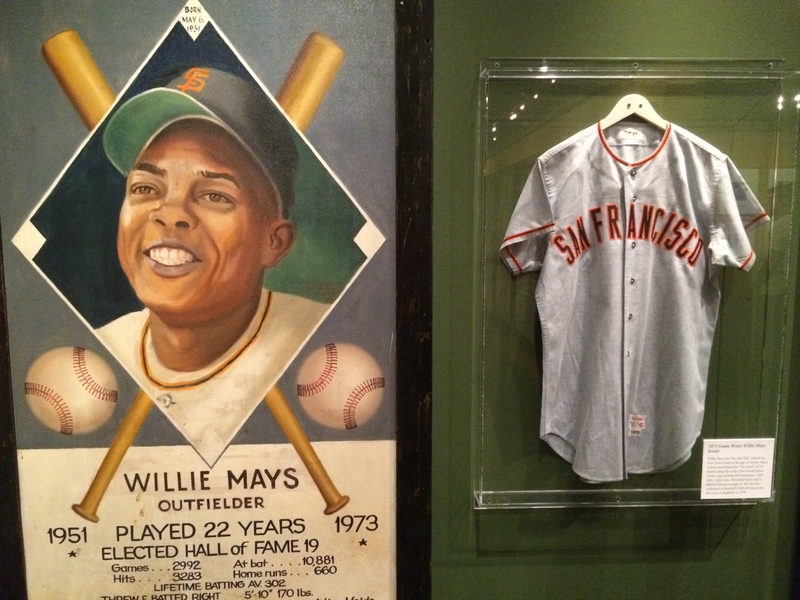 Willie Mays’s jersey was one of many out on display. I really liked the wall tributes like this one where you can get all the information you need about the player in one spot. 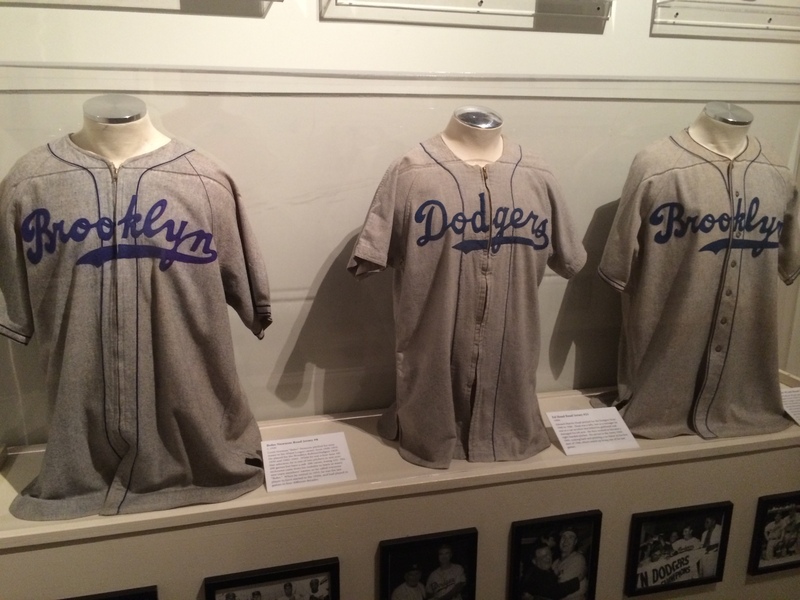 There was a rather large area that had artifacts from the Brooklyn Dodgers. 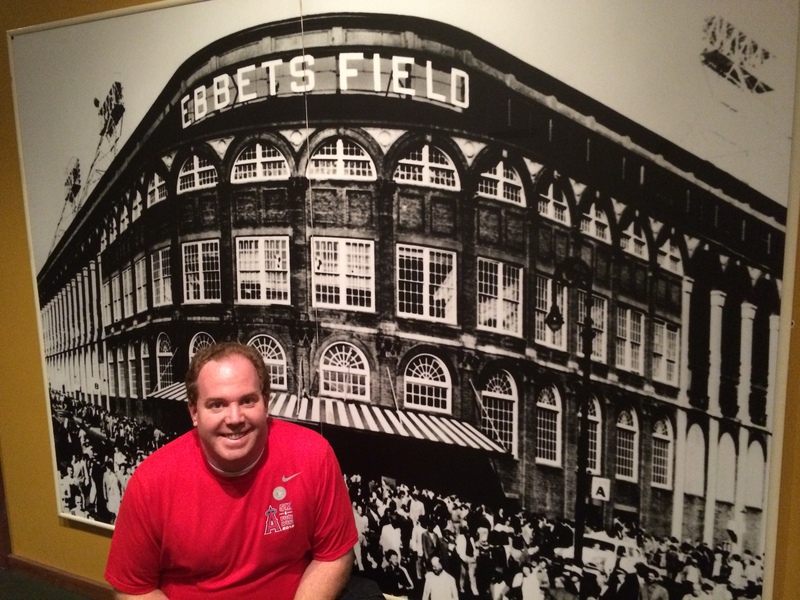 I had to pose by the large picture of Ebbets Field (home to the Brooklyn Dodgers). My mom remembers attending games here with her dad when she was little. My mom moved to the Los Angeles area right before the Dodgers. She jokes that the Dodgers followed her out to Los Angeles. 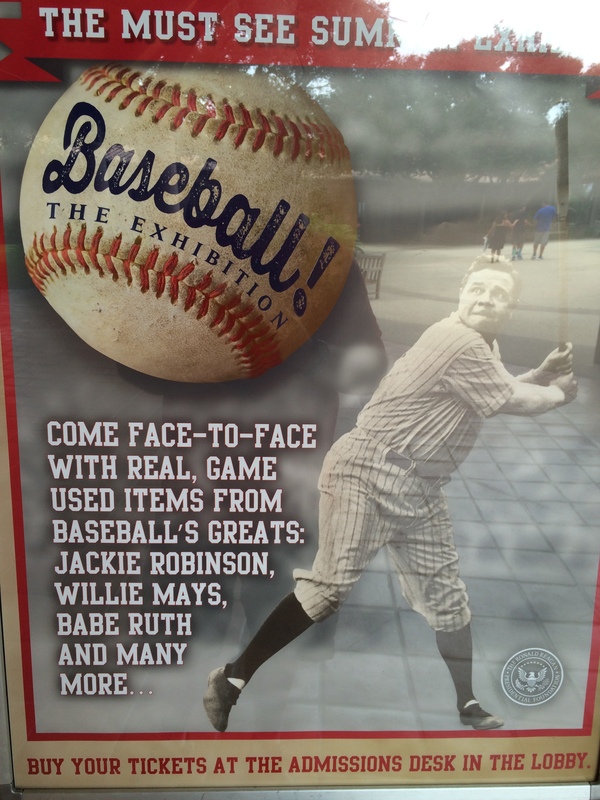 There were a lot of artifacts and displays about Jackie Robinson. 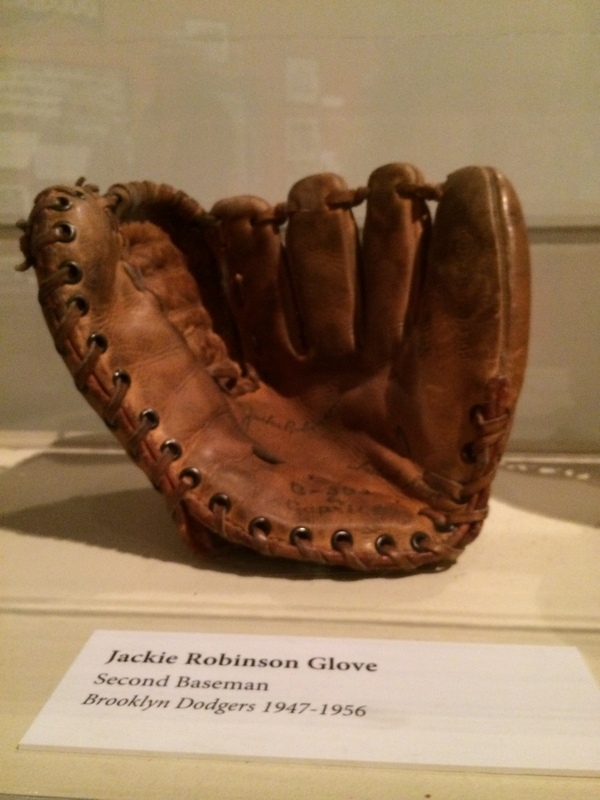 Here is his glove! 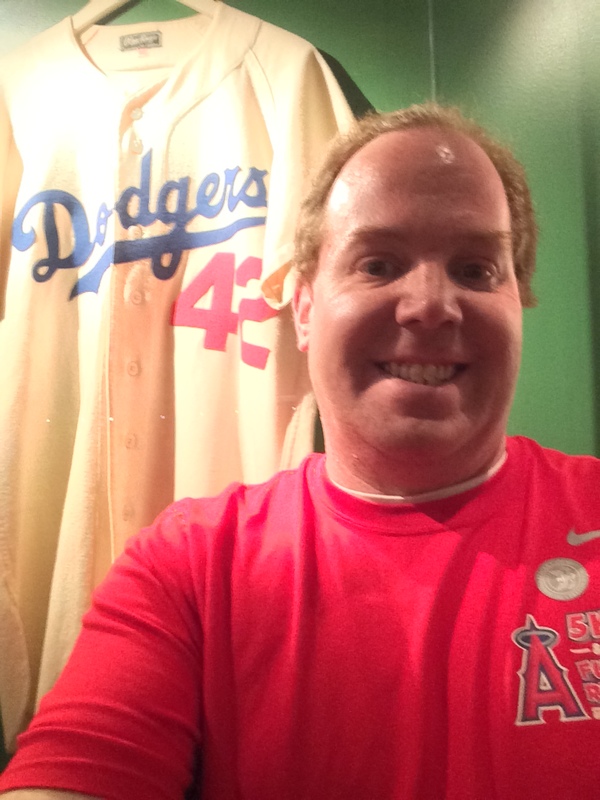 Here I am with Jackie Robinson’s jersey! Here Brooke and I are above the model of Yankee Stadium. They also had a model of Fenway Park and the model of Dodgers Stadium as it was when it first opened. 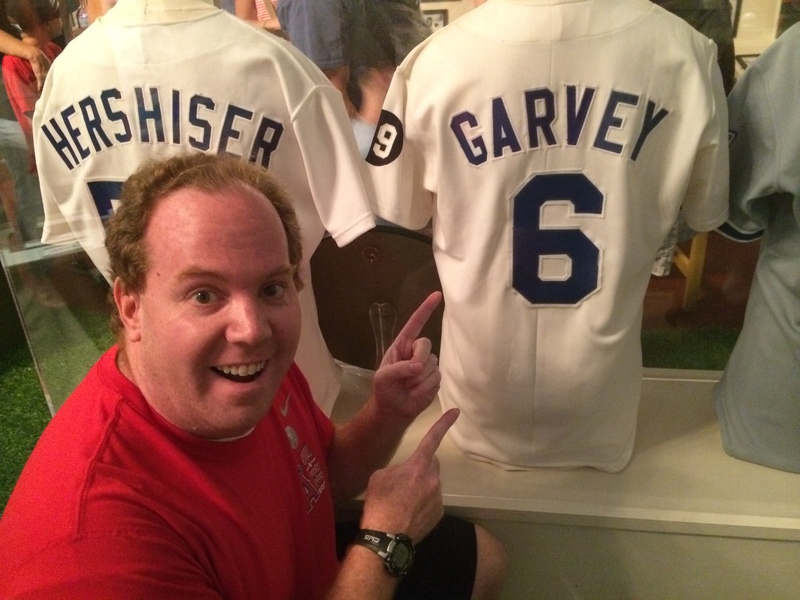 My favorite player growing up was Steve Garvey. So, I was pretty happy to see his jersey on display. 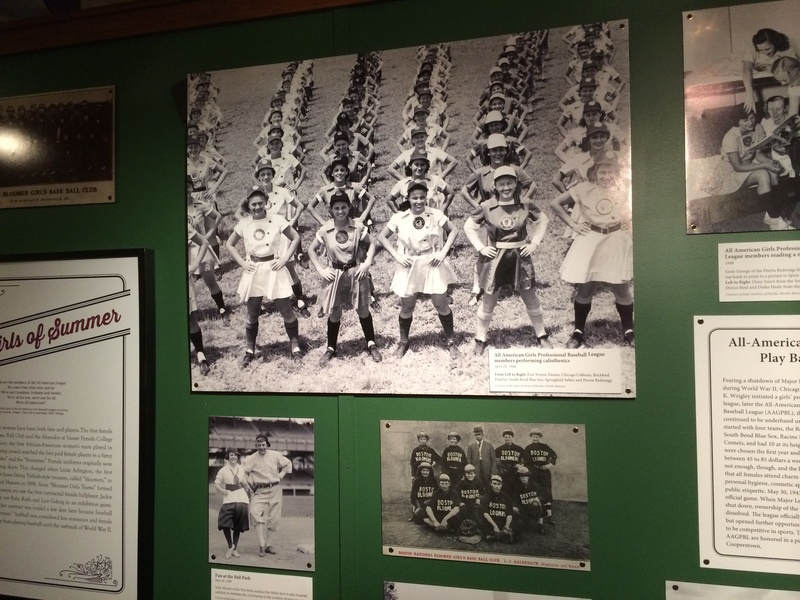 For those wondering, they even had an area for the All-American Girls Professional Baseball League. 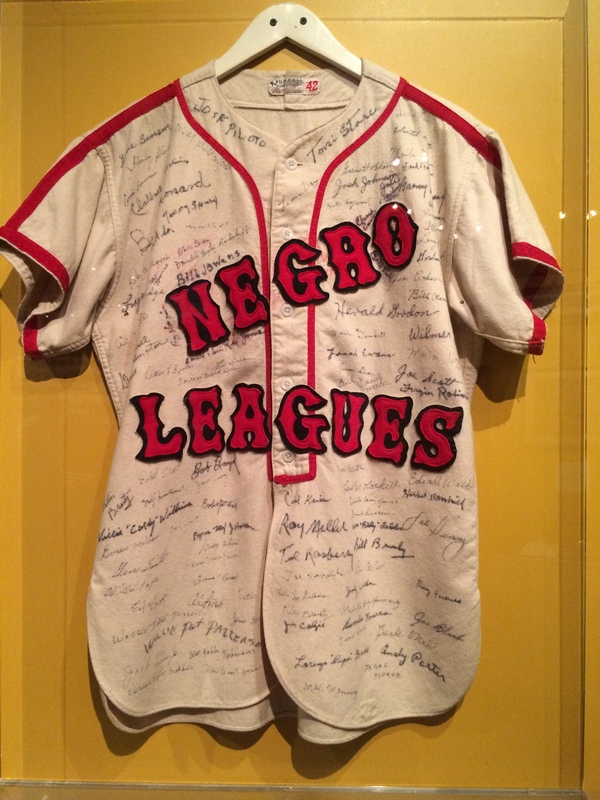 If you’ve seen A League of their Own, this is the league that movie is all about. The bottom floor was laid out like a baseball field! Since this exhibit was held at the Ronald Reagan Presidential Library, there has to be a tie-in to the former US President. As many know, Ronald Reagan was an actor before he got into politics. 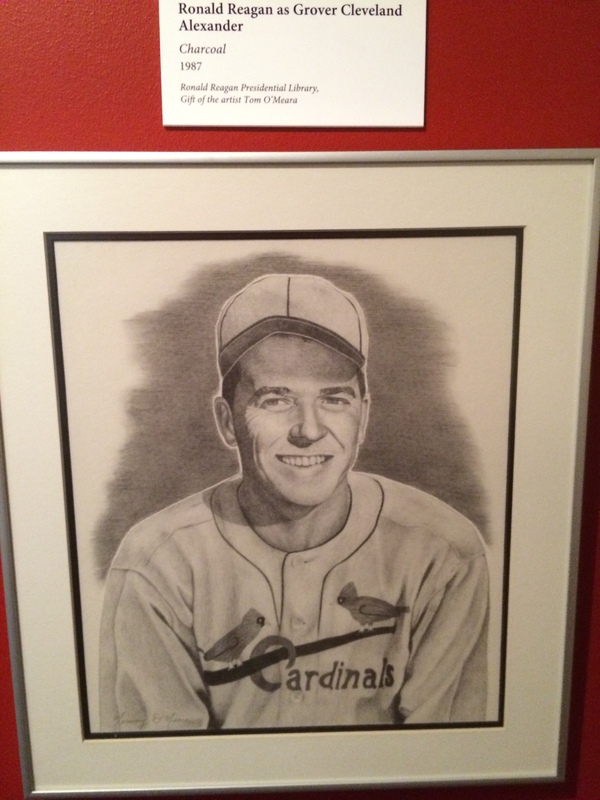 One of the roles he played was Grover Cleveland Alexander from the St. Louis Cardinals. 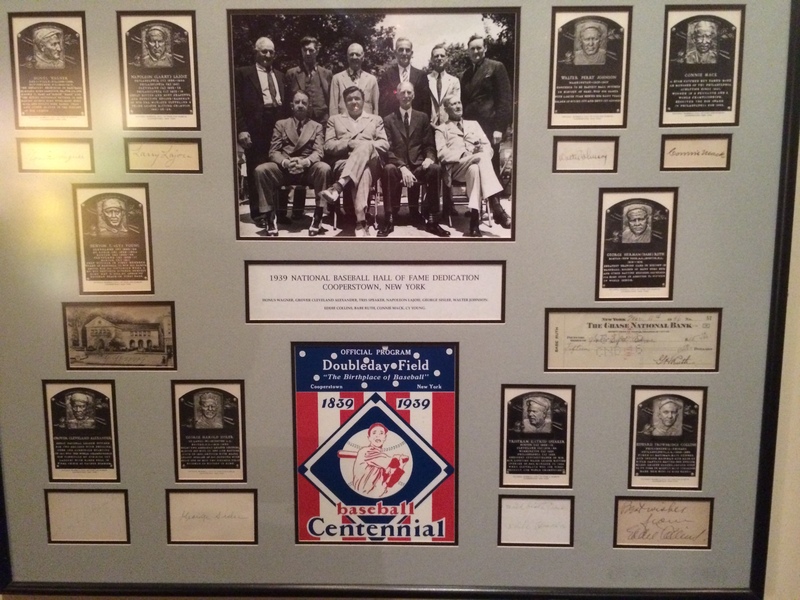 There were other artifacts that linked Ronald Reagan to baseball as well. 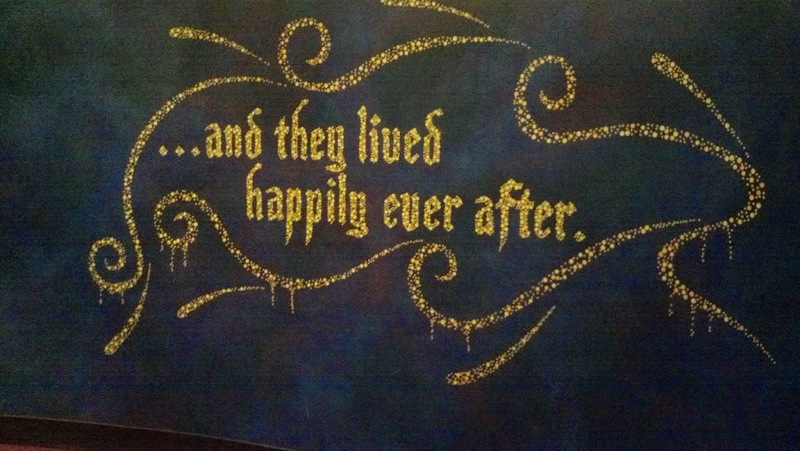 Brooke and I loved this exhibit so much. I’ve got over 200 pictures from this exhibit. So, I’m sorry for showing so many here. It was hard to choose which ones to show. 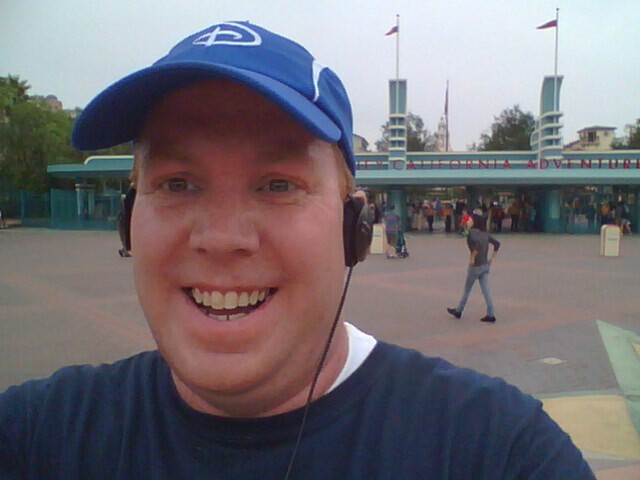 Sunday was supposed to be the day I recreated my Disneyland Half Marathon dress rehearsal run from one year ago. 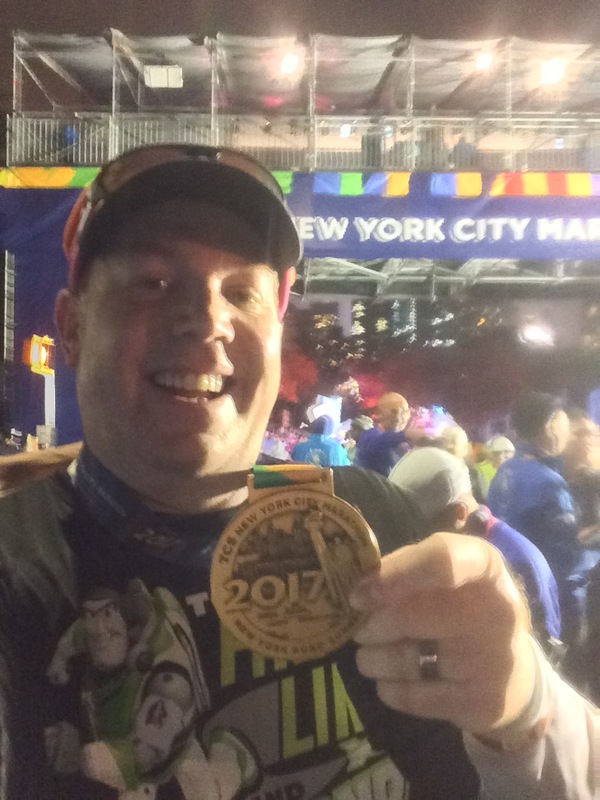 I was really excited about getting to do this run again as I’d get to run over most of the route that I’ll be running Labor Day weekend. Unfortunately, mother nature stepped in and altered the plan. 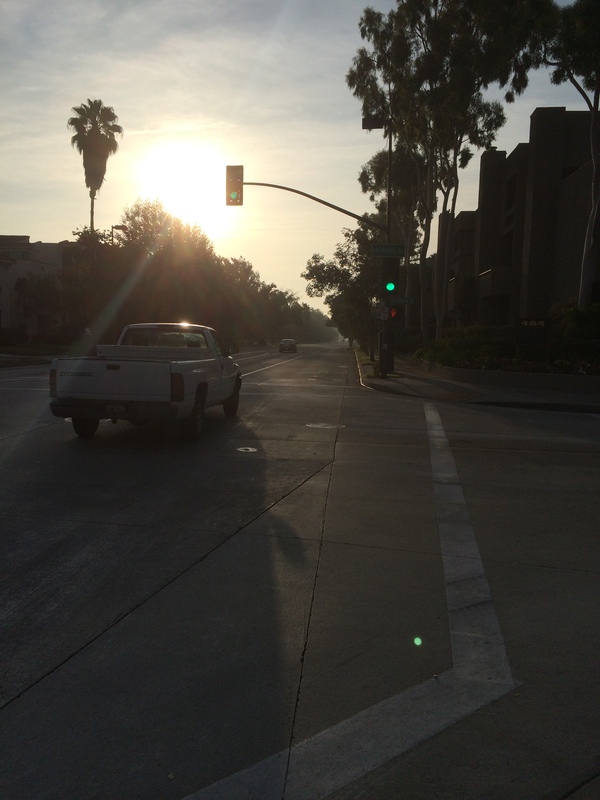 I woke up at 5:30am and was out the door shortly after 6am to drive down to Anaheim. However, I noticed right away that it was super humid outside. The last time I remember humidity like this was on my honeymoon at Walt Disney World. I also noticed that it had rained overnight. So, on my way to the car, I stopped an looked at my weather app to check the weather at Disneyland. For the entire time I thought I’d be running, there was a 50% chance of rain. I’ve never run in rain before and don’t really have gear for rain. Plus, it was going to be in the 70’s and reach into the 80’s by the time I’d finish. So, I went back up to my apartment to grab a sandwich bag to put over my phone to protect it. However, as I thought about it, I thought about how some of the path didn’t have sidewalks. So, I’d have to run either on dirt or grass. In the rain, that wouldn’t be so awesome. I decided to cancel the dress rehearsal because I didn’t know if it would work out logistically. That cancelation was a bummer. The weather was another. I’ve never run in weather like this before. 12.5 miles was too much for the treadmill. So, I planned a route around my apartment. There’s a nice 6 mile loop that I planned on running twice. The way I thought about it was that, if it rained and it was too much, I would be no more than 6 miles from home and could stop or take a break at home if I needed it. Running in humidity like this was brand new. After today, I don’t know how all those folks in the South and East Coast do it. I struggled with my breathing right from the beginning. Within a quarter mile, I was soaked in sweat. This wasn’t going well. My first mile was the slowest first mile I’ve ever run. 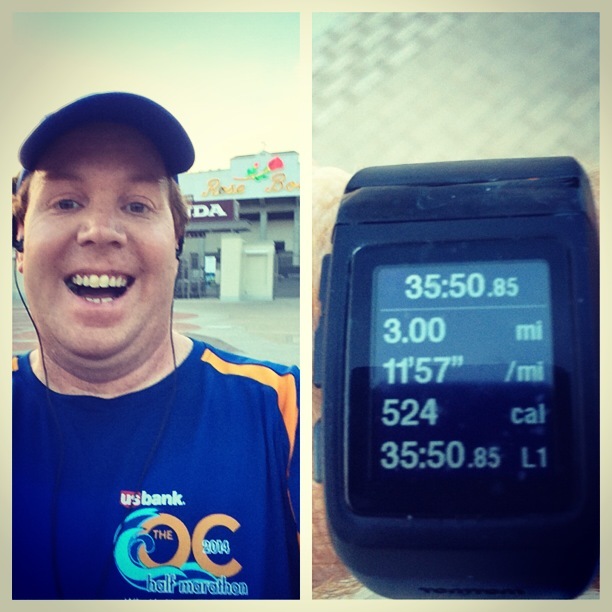 I kept trying to find a groove through the second mile to no avail. By the start of mile 3, I couldn’t take it anymore and cracked. I was tired, hot, and done with working so hard to breathe. I didn’t want to be doing this anymore. By 2.25 miles, my run was over. I would still have to finish 6 miles to get back home. But, I couldn’t run anymore. I tried a few times and lasted no longer than 10-15 seconds. It was over for the day. I was so done and frustrated. Even thought I kept the watch going, this is a run I don’t want to remember. 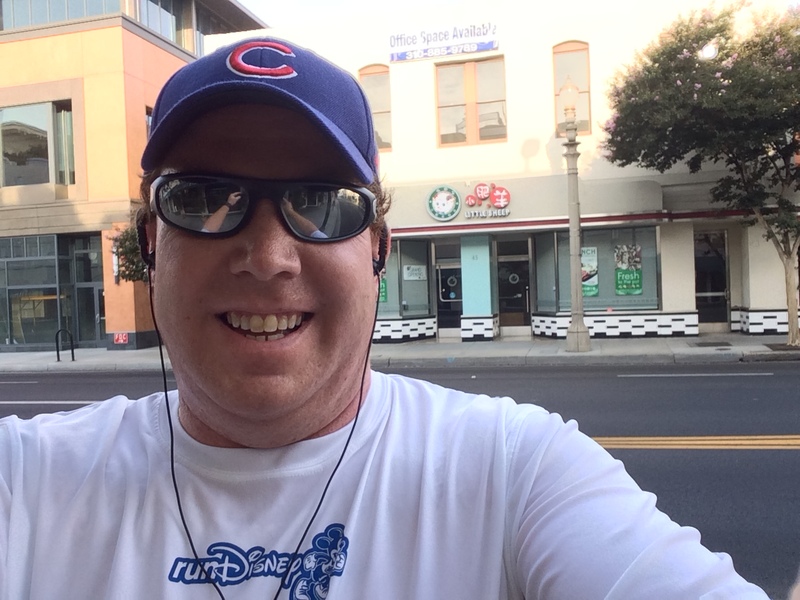 At 6 miles I had an average pace over 16 minutes per mile. It’s the very first time, I’ve had any distance run with that slow of a pace. I worked really hard to just to finish with that pace. By the end, I was exhausted. It felt bad to miss the mark. However, I honestly didn’t have it in me to do any more. There are no pictures from Sunday’s run because I simply don’t want to remember it. Even with a bad run in the books, it’s time to move on. Hopefully, the humidity won’t be this bad on race day. Yesterday the weather was CRAZY yesterday-I went down to Disneyland to renew my AP and it was raining and then so hot and humid. My boyfriend and I also went to the Beyonce concert last night (and walked it there to avoid traffic) and it was insanely humid too. hopefully the weather will calm down soon! I hope the weather gets better as well! Hope you had fun at the Beyoncé concert!